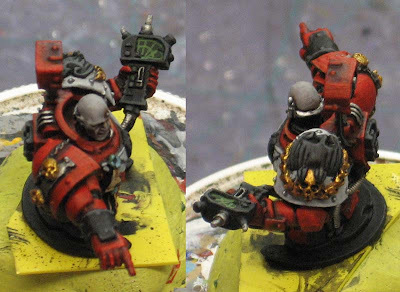 Same as before, Raven Guard iconography and all. On the mounted version, I thought it might be cool to have the bird's claws holding onto the skull and laurel so I tried my hand at sculpting them in place. Not the best, but a cool addition to the model when you look at him up close. Here's the construction of the standing model. 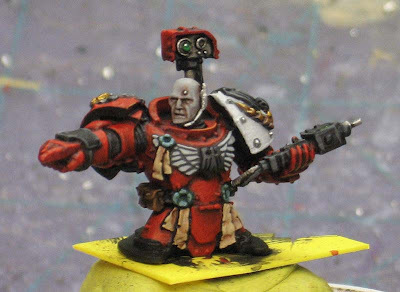 Next up is a Captain Sicarius conversion. This one is perhaps one of my all time favorites. Awesome idea, i have been looking for something to convert into a techmarine. I've always liked Chronus' helmet. Great conversion. Very believable. Great paint job as well. tough looking model. The guy on foot friggin sweet. Really nice colours, though I must ask how the mounted version is going to fit in the turret ring? Or is he not glued together yet? Utterly striking colourscheme you have there mate, love all the numerous details. Things still fit together, though the amount of little additions is straggering! Out of curiosity, how did you get that lovely skin tone. 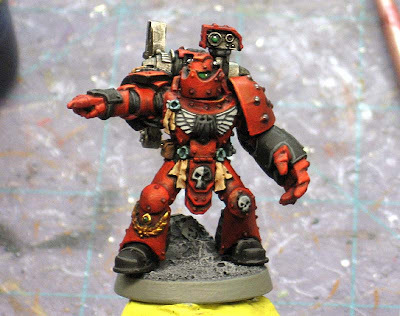 Thinking of making a Raven Guard squad somewhere down the line and they of course need some effective pale skin. 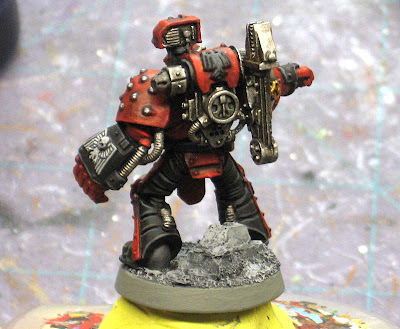 Willem-Jan: It's a cool, light grey color with an Ogryn flesh wash followed by the same light grey as the highlight. It's fairly simple really.